Word power is essential! It fuels self worth and empowers confidence and strong communication skills, essential for the 21st century. A good vocabulary is a hallmark of a well-educated person. 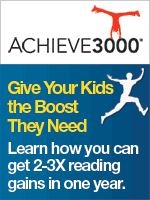 It's also a key to success on standardized achievement tests such as the SAT and ACT. But developing a good vocabulary does not have to be a boring process of rote memorization. 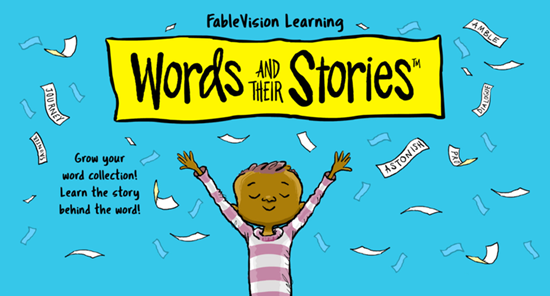 That's why the Co-op is pleased to offer Words and Their Stories, an award-winning, interactive vocabulary curriculum from FableVision Learning, founded by Peter H Reynolds. 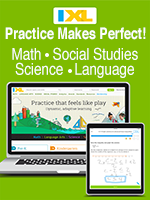 Your homeschool license will give you both a teacher access (allowing you to track your child's progress) and access for one student for a basic one-year license of $39. Each additional student is $25 per student per year. What's more, this is a DEAL OF THE WEEK! Place your order before the expiration date shown above and you'll get 250 Bonus SmartPoints. For decades, vocabulary study has relied on memorization and recall. However, these methods can be tedious and ineffective. Words and Their Stories (WATS) uses an engaging multimedia platform to transform the vocabulary acquisition process. WATS requires students to apply etymology and critical thinking skills (application, analysis, synthesis) in a sequential, inductive process to develop true understanding of word meaning. 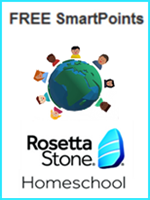 Words and Their Stories applies the WATS process to general vocabulary study, as well as standardized test preparation and literature-specific vocabulary that is then combined with activities designed to improve reading comprehension skills. 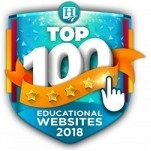 All products are delivered through engaging multimedia and are designed specifically for grades 5 and up, allowing both individualized instruction and self-paced study. Full assessment and reporting features are available and all programs meet or exceed both state and national standards. Finally, vocabulary study that is fun and effective! Browse the Words and Their Stories website. Fulfillment: Please allow 3 business days for us to process your order. When we have your subscription ready, we will email you with instructions. If you don't receive the email, simply sign into your Co-op account and look for instructions and a link on your "My Subscriptions" page. 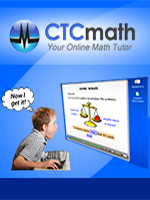 This BASIC license includes web-based and mobile friendly access for ONE TEACHER AND ONE STUDENT ONLY for one year. If you have additional students, please purchase the desired quantity of "Additional Student License" below. Following each Clue, students receive immediate feedback that explains the correct answer and purposefully prepares them for the next Clue. After the fifth Clue, they are provided with a precise dictionary-style definition and a Bonus Word(s). Drill down and find out how your student is doing in each type of word clue. See scores for each level of the program. Track student's improvement from Pre-test to Post-test. See which words your student completed, and the points they earned for each. Filter words by level of difficulty and/or theme, which makes lesson creation easy. Add your own words to the program. Create custom word lists to match curriculum you are studying. Create printable quizzes from any list. Take the Teacher Tour for more information. IMPORTANT: You MUST purchase a BASIC license (shown above) in order to purchase additional student licenses. PLEASE DO NOT purchase an "Additional Student License" if you haven't already placed an order for the BASIC license. You must purchase a separate license for each student in order to track each individual student's progress and test scores. You must purchase a separate licensefor each student in order to track each individual student's progress and test scores.